The Parish of All Saints in Dorchester, a parish of the Episcopal Church, was designed in 1892 by renowned architect Ralph Adams Cram and his partner Bertram Goodhue. It is considered one of Cram’s most important works and a landmark in American architectural history. All Saints became a prototype for 20th-century American church design in the Gothic Revival style. Enlisting the assistance of the finest American and European craftspeople including Charles Connick and Johannes Kirchmayer, Cram embellished the structure with additions, furnishings and art over the course of forty years. All Saints was consistently published in American and European architectural journals of the time. 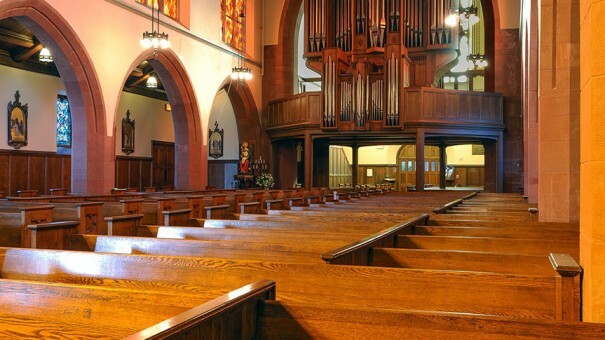 In 2009, after almost 120 years of church use, the Parish recognized the condition of the building had reached a critical point and began planning a comprehensive restoration project. In the summer of 2013, the Parish launched an extensive campaign to restore the original buildings, update systems, and improve accessibility. The Quincy granite was completely repointed and the masonry brick and stucco repaired. All of the stained glass, leaded glass, and other windows were restored, with many windows completely rebuilt to original specifications. Interior finishes were renewed, including the careful removal of paint, and the wooden window tracery in the church, which suffered from extensive hidden rot, was restored. The light fixtures, designed in 1923, were restored to their original appearance. The slate and copper roofs and gutters of the entire complex were repaired. Accessible entries were provided throughout the complex, including a sensitive new addition that eased access to the various sections of the complex. This project not only restored and enhanced this historic site—which represents an important part of the architectural heritage of Boston, the Commonwealth, and the country—but also ensures that All Saints can continue to be the center of the spiritual life of the diverse Parish and play a crucial role in the Dorchester neighborhood as a vibrant center of arts, education, and civic programming. The project wisely established an endowment to ensure the continued quality stewardship such an important building deserves.